Good News for Privacy Lovers!! An open source software group Open Whisper Systems has released the first free and Open Source phone call application for iPhone users, which is specifically designed to make secure and encrypted calls. When we talk about the privacy of our messages and voice calls, Open Whisper Systems has usually a very strong track record. Whisper is the company behind the development of RedPhone and TextSecure for Android, providing encrypted calls and texts respectively to users. Moving on to iOS devices, the company decided to produce simplest and easiest interfaces yet. Better known as Signal, a free iOS app designed to enable easy and strongly encrypted voice calls. 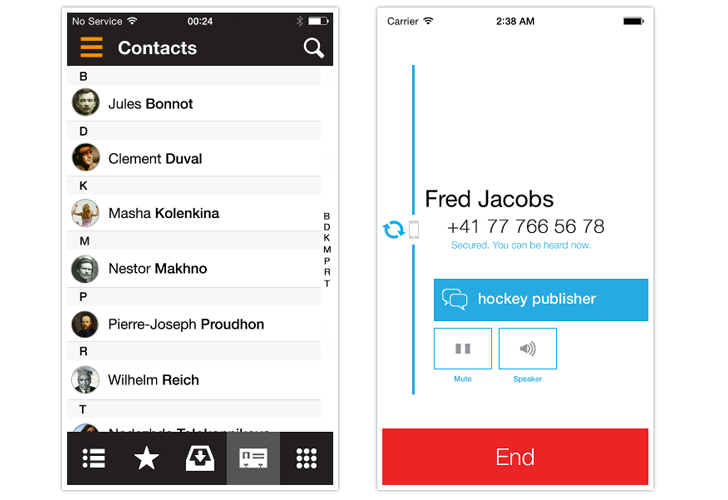 The Signal application for iPhone is completely compatible with OWS’s time-tested and well-known RedPhone. Eventually, Signal will be a combination of both RedPhone and TextSecure in a single Android application, according to a blog post. Signal makes use of end-to-end encryption which helps secure iPhone conversations so that any third-party can’t listen the voice conversation. All calls through Signal app function just like any normal phone call using WiFi or Internet connection, but it uses a caller's standard phone number to make and receive calls. Free: Signal is Free to install and use. As we know, there is a huge market out there that offers many voice call encryption products for different platforms, but most of them are not cheap or free. Open Source App: Signal is an open source that means its code is available to all, so it gives app developers opportunity to verify the app’s integrity. This feature is very important because of the concerns that software vendors have been forced to add “backdoors” into their products in order to assist government surveillance programs. High Privacy: Signal provides end-to-end encryption of voice calls over a data connection. Installing Signal to your devices requires some simple steps. You have to just verify the device’s phone number through a one-time code that is sent to you via an SMS. The app will display only the contact details of those user who has installed Signal. Signal uses ZRTP, a widely-used secure voice communication protocol and sends push notifications when phone calls are received to save battery life. The app displays two words on the screen during a voice call, these words are meant to be verified with the end user to avoid any man-in-the-middle (MitM) attack. If they don’t match, it’s a sign of a MitM attack. Washington-based software firm Silent Circle, offers encrypted calling and texting services for a monthly subscription, and is a partner in Geneva-based SGP Technologies which makes the BlackPhone, a security minded device released last month that offers ‘PrivatOS’, an Android based operating system which will allow users to make and receive secure phone calls, exchange secure texts, encrypted file storage, secure video chat, browse privately, and anonymize your activity through a VPN (virtual private network).